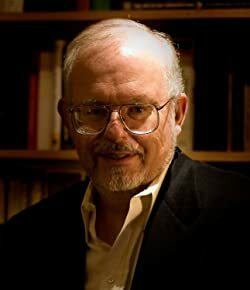 Greg Bear was born in San Diego, California and is the author of more than thirty books of science fiction and fantasy. Awarded two Hugos and five Nebulas for his fiction, one of two authors to win a Nebula in every category, Bear has been called the “Best working writer of hard science fiction” by The Ultimate Encyclopedia of Science Fiction. Bear has served on political and scientific action committees and has advised Microsoft Corporation, the U.S. Army, the CIA, Sandia National Laboratories, Callison Architecture, Inc., Homeland Security, and other agencies. Learn more at Greg Bear’s website. CLICK HERE TO FIND MORE BOOKS BY GREG BEAR. Songs of Earth and Power — (1984-1986) Publisher: There is a song you dare not sing — a melody that you dare not play, a concerto that you dare not hear: It is called a Song of Power. It is a gateway to another world — a gate that will lock behind you as you pass, barring you from the Earth forever. Resist at all cost. For it is a world of great danger and great beauty — and it is not good to be human in the Realm of the Sidhe. I give myself credit for finishing The Infinity Concerto, the first book of Songs of Earth and Power, written by Greg Bear in 1986. The Infinity Concerto has a compelling opening chapter but fails to deliver on that chapter’s promise. Michael Perrin, the book’s main character, is a sixteen-year-old boy living in southern California, an only child who wants to be a poet. At a family party his father introduces him to the composer Arno Waltiri. Waltiri is a man with a strange story about another man, Clarkham, who persuaded Waltiri to write a concerto. Shortly after it was played for the first and only time, people began to disappear. Over time, twenty people who were in the audience vanished from Earth. Darwin — (1999-2003) Publisher: “Virus hunter” Christopher Dicken is a man on a mission, following a trail of rumors, government cover-ups, and dead bodies around the globe in search of a mysterious disease that strikes only pregnant women and invariably results in miscarriage. But when Dicken finds what he’s looking for, the answer proves to be stranger — and far deadlier — than he ever could have imagined. Something that has slept in human DNA for millions of years is waking up. Molecular biologist Kaye Lang has spent her career tracing ancient retroviruses in the human genome. She believes these microscopic fossils can come to life again. But when Dicken’s discovery becomes public, Lang’s theory suddenly turns to chilling fact. As the outbreak of this terrifying disease threatens to become a deadly epidemic, Dicken and Lang must race against time to assemble the pieces of a puzzle only they are equipped to solve — an evolutionary puzzle that will determine the future of the human race… if a future exists at all. 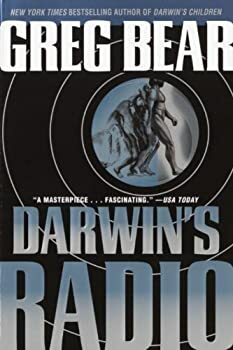 Darwin's Radio by Greg Bear follows several characters — a molecular biologist, an archaeologist, and a public policy maker — through a cataclysmic pandemic sweeping through the human race. This disease is an HERV, a human endogenous retrovirus, which is a piece of dormant genetic code that, when activated, only affects sexually-active women. It causes them to get pregnant with a horribly-mutated fetus that self-aborts, only to follow up with another pregnancy of a new species of human, homo novus. The Foreworld — (2012-2013) This is a collaboration between Neal Stephenson, Erik Bear, Greg Bear, Joseph Brassey, E.D. deBirmingham, Cooper Moo, and Mark Teppo. 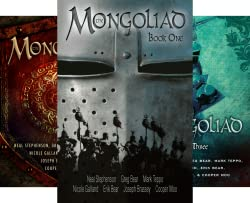 Publisher: The first novel to be released in The Foreworld Saga, The Mongoliad: Book One, is an epic-within-an-epic, taking place in 13th century. In it, a small band of warriors and mystics raise their swords to save Europe from a bloodthirsty Mongol invasion. Inspired by their leader (an elder of an order of warrior monks), they embark on a perilous journey and uncover the history of hidden knowledge and conflict among powerful secret societies that had been shaping world events for millennia. But the saga reaches the modern world via a circuitous route. In the late 19th century, Sir Richard F. Burton, an expert on exotic languages and historical swordsmanship, is approached by a mysterious group of English martial arts aficionados about translating a collection of long-lost manuscripts. Burton dies before his work is finished, and his efforts were thought lost until recently rediscovered by a team of amateur archaeologists in the ruins of a mansion in Trieste, Italy. From this collection of arcana, the incredible tale of The Mongoliad was recreated. Full of high adventure, unforgettable characters, and unflinching battle scenes, The Mongoliad ignites a dangerous quest where willpower and blades are tested and the scope of world-building is redefined. CLICK HERE FOR MORE FOREWORD SAGA BOOKS. The series of books known as THE FOREWORLD SAGA was a grand experiment in collaboration and serialized storytelling involving more than half a dozen authors, including Neal Stephenson and Greg Bear. So far it includes three novels (individually titled The Mongoliad, Books One, Two, and Three) which relate the central tale set during a near-history version of the Mongol invasions of the mid-thirteenth century. Also available are several short stand-alone prequels and "sidequests," some in graphic format, which are set in the world during different time periods. Ambition in both scope and execution, the experiment seems to me to have been mostly successful, if not wholly so. The Assassination of Orange is another short (only two hours in audio) “sidequest” in the FOREWORLD universe shared by Neal Stephenson, Greg Bear, Mark Teppo, and others. 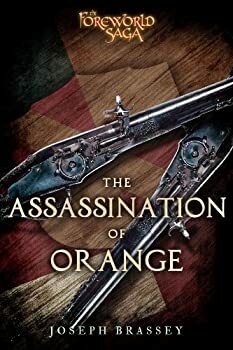 Like the other sidequest I read, The Assassination of Orange is strictly historical fiction — there are no supernatural elements. It stands alone, so you don’t need to have read any of the other FOREWORLD stories. I don’t think early Greg Bear and I are a good match. I did not finish The Wind From a Burning Woman, a collection of short stories from the late 1970s and early 1980s. That may be part of the problem. Maybe these stories are just dated. Bear seems to be a “writer of ideas,” and several of these tales feature fascinating “what-ifs” or technological wonders, like an asteroid shaped into a deep-space vessel, a surrealistic cathedral in a world where God has definitively Died, or a walking city. Unfortunately, problems with characters and prose undercut the gadgets or the thought exercises. 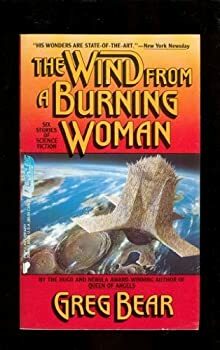 In “The Wind From a Burning Woman,” a desperate woman threatens Earth’s draconian nanny-government with an act of global terrorism in order to force out the truth. 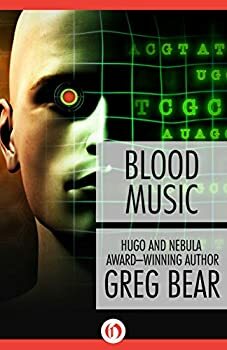 Blood Music (1985) by Greg Bear is a novel that, in its day, was well lauded, but has since had its profile reduced by books which have taken its central premise further. One of, if not the first, major novel to utilize the idea of nanotechnology, the wave of related sci-fi digging deeper into the potential for nanotech that has followed has perhaps drowned out the book, leaving it to be found by those looking back into the history of the genre. While the classic comic book opening does not endear the story, the concept it evolves into stands as an abstract extrapolation — at least, not of the superhero variety. 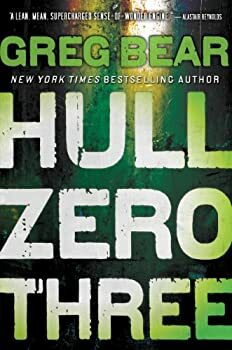 Greg Bear’s Hull Zero Three is a science fiction thriller with a touch of horror thrown in for good measure. Short Fiction Monday: Here are some of the stories we read this week that we wanted you to know about. This week we continue focusing on 2015 Nebula-nominated short fiction, along with some other stories that caught our attention. Eon — (1985-1995) Publisher: The 21st century was on the brink of nuclear confrontation when the 300 kilometer-long stone flashed out of nothingness and into Earth’s orbit. NASA, NATO, and the UN sent explorers to the asteroid’s surface… and discovered marvels and mysteries to drive researchers mad. For the Stone was from space — but perhaps not our space; it came from the future — but perhaps not our future; and within the hollowed asteroid was Thistledown. The remains of a vanished civilization. A human — English, Russian, and Chinese-speaking — civilization. Seven vast chambers containing forests, lakes, rivers, hanging cities… And museums describing the Death; the catastrophic war that was about to occur; the horror and the long winter that would follow. But while scientists and politicians bickered about how to use the information to stop the Death, the Stone yielded a secret that made even Earth’s survival pale into insignificance. Forge of God — (1987-1992) Publisher: On July 26th, Arthur Gordon learns that Europa, the sixth moon of Jupiter, has disappeared. Not hiding, not turned black, but gone. On September 28th, Edward Shaw finds an error in the geological records of Death Valley. A cinder cone was left off the map. Could it be new? Or, stranger yet, could it be artificial? The answer may be lying beside it — a dying Guest who brings devastating news for Edward and for Planet Earth. As more unexplained phenomena spring up around the globe — a granite mountain appearing in Australia, sounds emanating from the Earth’s core, flashes of light amongst the asteroids — it becomes clear to some that the end is approaching, and there is nothing we can do. In THE FORGE OF GOD, award-winning author Greg Bear describes the final days of the world on both a massive, scientific scale and in the everyday, emotional context of individual human lives. Facing the destruction of all they know, some people turn to God, others to their families, and a few turn to saviors promising escape from a planet tearing apart. Will they make it in time? And who gets left behind to experience the last moments of beauty and chaos on Earth? Nominated for a Nebula Award for Best Novel in 1987 and for Hugo and Locus Awards in 1988, THE FORGE OF GOD is an engrossing read, breathtaking in its scope and in its detail. Quantico — (2005-2009) Publisher: It’s the second decade of the twenty-first century, and terrorism has escalated almost beyond control. The Dome of the Rock in Jerusalem has been blown to bits by extremists and, in retaliation, thousands have died in another major attack on the United States. New weapons are being spawned in remote basement labs. No one feels safe. In North America, the FBI uses cutting-edge technology to thwart domestic terrorists. Sat-linked engine blockers stop drug-traffickers cold; devices the size of Magic Markers test for bio-hazards on the spot; 3-D projectors reconstruct crime scenes from hours-old evidence; and sophisticated bomb suits protect against all but the most savage forces. Despite all this, the War on Terror has reached a deadly stalemate. Now the FBI has been dispatched to deal with a new menace. Like the Anthrax threat of 2001, a plague targeted to ethnic groups — Jews or Muslims or both — has the potential to wipe out entire populations. But the FBI itself is under political assault. There’s a good chance agents William Griffin, Fouad Al-Husam, and Jane Rowland will be part of the last class at Quantico. As the young agents hunt a brilliant homegrown terrorist, they join forces with veteran bio-terror expert Rebecca Rose. But the plot they uncover-and the man they chase-proves far more complex than anyone expects. Psychlone — (1979) Publisher: The nuclear bomb is the only weapon so terrible that it destroys not only the human body, but the human soul. But what of those souls that were not destroyed, but maimed and ruptured by the blast at Hiroshima? They are coming, across the Pacific ocean, leaving blood and destruction in their wake, searching for revenge. They are the Psychlone! Larry Fowler is a scientist — he doesn’t want to be frightened by things he doesn’t understand. However, he can’t stop asking questions — questions that will bring him face to face with psychlone. Hegira — (1979) Publisher: The planet Hegira is the universe’s melting pot. Hundreds of tribes in dozens of cities intermingle in the vast uncharted territory. The only thing holding the people together are the massive Obelisks, the chronicles of the all the truths and falsehoods each tribe has brought to Hegira. Young Bar-Woten is in search of knowledge and he knows the key to the truth about his homeland is contained in the writings of the Obelisks. With his fellow companions, Bar-Woten must travel through Hegira’s exotic cities to discover the lies within the words of thousands. Beyond Heaven’s River — (1980) Publisher: Yoshio Kawashita is a great warrior until aliens whisk him away during World War II. They put him on a desolate planet far from his home, where he is destined to remain forever, leaving him alone in his new hell. Then Anna Nestor appears. This empress does not see planets as homes for their inhabitants; she sees exploitable real estate. At first, Anna Nestor views Kawashita as a sideshow attraction until they fall in love. But the two cannot be free until they find out who kidnapped Kawashita and why. Strength of Stones — (1981) Publisher: In a theocratic world far into the future, cities control their own movements and organization. Constantly moving, growing and decaying, taking care of every need their inhabitants might think of, the cities have decided that humans are no longer a necessary part of their architecture, casting them out to wander in the wilderness and eke out a meager subsistence. To the exiled humans, the cities represent a paradisiacal Eden, a reminder of all they cannot attain due to their sinful and unworthy natures. But things are beginning to change. People are no longer willing to allow the cities to keep them out, choosing instead to force an entry and plunder at will. The cities are starting to crumble and die because they have no purpose or reason to continue living without citizens. One woman, called mad by some and wise by others, is the only human allowed to inhabit a city. 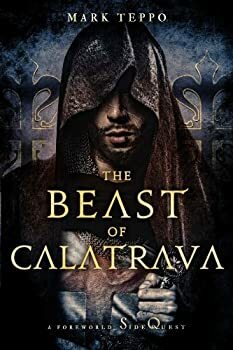 From her lonely and precarious position at the heart of one of the greatest cities ever, she must decide the fate of the relationship between human society and the ancient strongholds of knowledge, while making one last desperate attempt to save the living cities. Heads — (1990) Publisher: In an abandoned mining colony at the Lunar Ice Pit Station, two experiments may science forever. One is achieving Absolute Zero — a temperature so cold it can bend the laws of physics. The other involves 410 human heads, severedand fr ozen for decades, whose memories may hold the keys to death… and beyond. Martin’s. 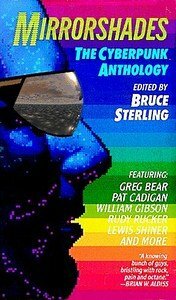 Bear’s Fantasies: Six stories in old paradigms — (1992) Publisher: Greg Bear has been called the “best working writer of science fiction” by The Ultimate Encyclopedia of Science Fiction. He has been awarded two Hugo and four Nebula Awards, and holds the distinction of being one of two authors to win a Nebula in every category. His novel Darwin’s Radio, published by Ballantine Books, won the Nebula Award for “Best Novel of 2000,” and was honored with the prestigious Endeavor Award. His novels and short stories have been translated into fifteen languages. Moving Mars — (1993) Publisher: Moving Mars is a story of human courage and love set within the greater saga of a planetary liberation movement. Mars is a colonial world, governed by corporate interests on Earth. The citizens of Mars are hardworking, but held back by their lack of access to the best education, and the desire of the Earthly powers to keep the best new inventions for themselves. The young Martians — the second and third generations born on Mars — have little loyalty to Earth, and a strong belief that their planet can be independent. The revolution begins slowly, but will grow in power over decades of political struggle until it becomes irresistible. Told through the eyes of an extraordinary character, Casseia Majumdar, a daughter of one of Mars’ oldest, most conservative Binding Multiples, Moving Mars is Greg Bear’s brilliant conception of the human colonization of the red planet, with lovingly painted details and a grand historical sweep, embellishing an audacious scientific speculation. Dinosaur Summer — (1998) Publisher: Fifty years after professor Challenger’s discovery of the Lost World, America’s last dinosaur circus has gone bankrupt, leaving a dozen avisaurs, centrosaurs, ankylosaurs, and one large raptor abandoned. Now a daring expedition plans to do the impossible: return the Jurassic giants to the wild. Two filmmakers, a circus trainer, a journalist, and a young Peter Belzoni must find a way to take the dinosaurs across oceans, continents, rivers, jungles, up a mountain that has been isolated for 70,000 years… Then if they make it, all they’ll do is face all the prehistoric wonders, dangers, and terrors of the Lost World. Vitals — (2002) Publisher: Blending fierce, fast plots with vivid characters and mind-bending ideas, Greg Bear has mastered a powerful alchemy of suspense, science, and action in his gripping thrillers. Darwin’s Radio was hailed across the country as one of the best books of the year. His newest novel, Vitals,begins with a harrowing descent to a netherworld at the very bottom of the sea – and then explodes to the surface in sheer terror. Hal Cousins is one of a handful of scientists nearing the most sought after discovery in human history: the key to short-circuiting the aging process. Fueled by a wealth of research, an overdose of self-confidence, and the money of influential patrons to whom he makes outrageous promises, Hal experiments with organisms living in the hot thermal plumes in the ocean depths. But as he journeys beneath the sea, his other world is falling apart. Across the country, scientists are being inexplicably murdered – including Hal’s identical twin brother, who is also working to unlock the key to immortality. Hal himself barely eludes a cold-blooded attack at sea, and when he returns home to Seattle, he finds himself walking into an eerie realm where voices speak to him from the dead… where a once-brilliant historian turned crackpot is leading him on a deadly game of hide-and-seek… and where the beautiful, rich widow of his twin is more than willing to pick up the pieces of Hal’s life – and take him places he’s never been before. Suddenly Hal is trapped inside an ever-twisting maze of shocking revelations. For he is not the first person to come close to ending aging forever – and those who came before him will stop at nothing to keep the secret to themselves. Now every person on earth is at risk of being made an unsuspecting player in one man’s spectacular and horrifying master plan. Dead Lines — (2004) Publisher: With his acclaimed novels Darwin’s Children and Vitals, award-winning author Greg Bear turned intriguing speculation about human evolution and immortality into tales of unrelenting suspense. Now he ventures into decidedly more frightening territory in a haunting thriller that blends modern technology and old-fashioned terror, as it charts one man’s inexorable descent into a world of mounting supernatural dread.For the last two years, Peter Russell has mourned the death of one of his twin daughters — who was just ten when she was murdered. Recent news of his best friend’s fatal heart attack has now come as another devastating blow. Divorced, despondent, and going nowhere in his career, Peter fears his life is circling the drain. Then Trans comes along. The brainchild of an upstart telecom company, Trans is (as its name suggests) a transcendent marvel: a sleek, handheld interpersonal communication device capable of flawless operation anywhere in the world, at any time. “A cell phone, but not” — transmitting with crystal clarity across a newly discovered, never-utilized bandwidth… and poised to spark a new-technology revolution. When its creators offer Peter a position on their team, it should be a golden opportunity for him. If only he wasn’t seemingly going mad. Everywhere Peter turns, inexplicable apparitions are walking before him or reaching out in torment. After a chilling encounter with his own lost child he begins to grasp the terrifying truth: Trans is a Pandora’s box that has tapped into a frequency not of this world… but of the next. And now, via this open channel to oblivion, the dead have gained access to the living. For Peter, and for humankind, a long, shadowy night of the soul has descended, bringing with it the stuff of a horrifying nightmare from which they may never awaken. By turns spine-tingling, provocative, and heart-wrenching, Dead Lines marks a major turning point in the consistently dazzling storytelling career of Greg Bear. Alongside its hero, Dead Lines peers into the darkest place we can imagine and wonders — fearfully — what might be peering back. City at the End of Time — (2008) Publisher: In a time like the present, in a world that may or may not be our own, three young people – Ginny, Jack, and Daniel – dream of a decadent, doomed city of the distant future: the Kalpa. But more than dreams link these three: They are fate-shifters, born with the ability to skip across the surface of the fifth dimension, inhabiting alternate versions of themselves. And each guards an object whose origin and purpose are unknown: gnarled, stony artifacts called sum-runners that persist unchanged through all versions of time. Hunted by others with similar powers who seek the sum-runners on behalf of a terrifying, goddess-like entity known as the Chalk Princess, Ginny, Jack, and Daniel are drawn into an all but hopeless mission to rescue the future – and complete the greatest achievement in human history.